Have I ever mentioned that I love garlic? She Who Must Be Obeyed likes garlic but I love garlic. She occasionally points out I tend to use too much garlic. Also, she doesn’t care for braised meat very much. I recently had a birthday. Most people like to have a fancy meal made for them on their birthday. Old Fat Guys like to cook their own meal. Also, I knew She Who Must Be Obeyed would let me cook whatever I wanted. I wanted a pot roast and I wanted a lot of garlic. Garlic Tomato Pot Roast was born. 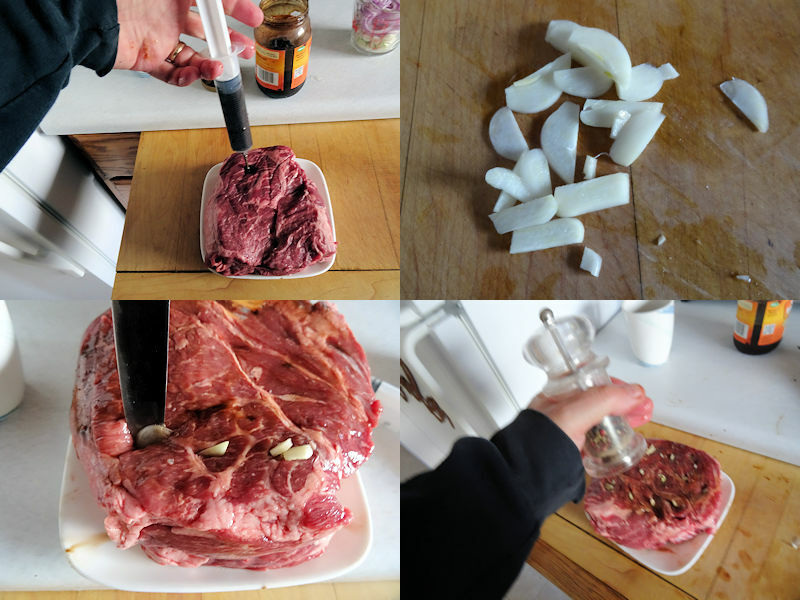 I picked up a three pound blade roast and injected it with Cajun Injector Creole Garlic. This is optional but did I mention I love garlic? I cut three cloves of garlic into slices. Did I mention I love garlic? I cut small slices into the surface of the roast and inserted the sliced garlic into the cuts. Did I mention I love garlic? I gave the surface of the roast a sprinkle of salt and pepper. I heated vegetable oil in a large Dutch oven over medium high heat. I browned the roast on all sides. I took the roast out of the Dutch oven. I sautéed the onion in the saucepan until it picked up some of the colour and there was nice golden brown on the bottom of the Dutch oven. I added the condensed tomato soup, beef stock, soy sauce, Worcestershire sauce, and berbere spice or chili powder. Put the meat in the Dutch Oven and bring the liquid to a boil. Put the Dutch oven in a preheated 325 F oven and cook it for 1 hour 45 minutes. While the roast is cooking, clean 6 medium soft skinned potatoes. After the 1 hour and 45 minutes has finished, put the potatoes into the liquid around the roast. Put the Dutch oven back in the oven for another 1 hour and 15 minutes. Take the meat and potatoes out of the liquid. Put the potatoes in the oven to keep warm and let the meat rest on the cutting board. Strain the liquid and defat it by using a turkey baster to pull the liquid from under the fat. Put the liquid and the onions from the strainer back in the Dutch oven over medium heat. Mix the cornstarch with the water to make a slurry. Mix the slurry into the liquid and heat until thickened, stirring constantly. Set the gravy aside. Carve the meat and serve it with the potatoes and gravy. I said I like to cook for myself on my birthday. I lied a little bit. She Who Must Be Obeyed made me Copper Pennies to have with my pot roast and potatoes! I love the meat. It was nice and tender and had a great hit of garlic. The gravy was delicious with a nice acid hit from the tomato soup, a great consistency and nice garlic flavour. Did I mention I love garlic? I love potatoes done this way. They have a great texture that no other method of cooking gives. It was a perfect birthday meal. 250 ml (1 cup) onion, chopped. Inject the Garlic Creole marinade in several places if using. Slice the garlic into thing slices. Push a knife into the roast to make small slit. Insert a slice of garlic into the slit. Continue all over the surface of the roast with the rest of the garlic. Heat the oil in a Dutch oven over medium high heat. Brown the roast on all sides and remove from the Dutch oven. Sauté the onion until it is getting coloured and the bottom of the Dutch oven is a nice golden brown colour. Add the soup, beef stock, soy sauce, Worcestershire sauce, and berbere spice or chili powder. Put the beef back in the liquid and bring it to a boil. Put the covered Dutch oven in a preheated 325 F oven for 1 hour 45 minutes. Put the potatoes around the beef and put the covered Dutch oven back in the oven for 1 hour 15 minutes. Put the beef on a cutting board to rest. Put the potatoes in the oven to keep warm. Strain the liquid and defat it. Put the onions from the strainer back in the liquid and heat over medium heat. Mix the cornstarch with the water to make a slurry. Mix the slurry into the liquid and heat until thickened. 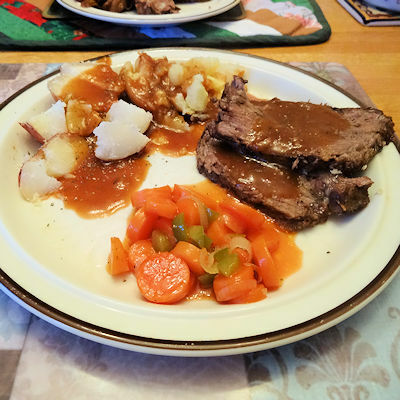 Slice the beef and serve with the gravy and potatoes. Happy belated birthday! I love cooking my own birthday dinner too and yours looks lovely! Thanks, Carlee. It was very tasty!